A typical Friday night for most people involves going out to a bar and throwing back some drinks with friends. At 2:00 a.m. on Friday I found myself running across the Colorado-Wyoming border under a meteor shower. It was perhaps an atypical way to spend a Friday. Did I completely lose my mind? 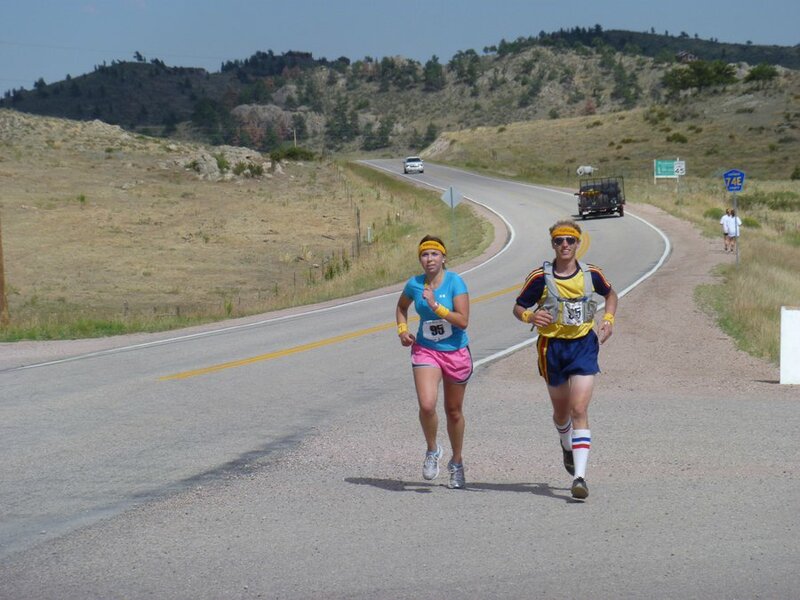 Nope, I was just running my second leg in the Wild West Relay (WWR). 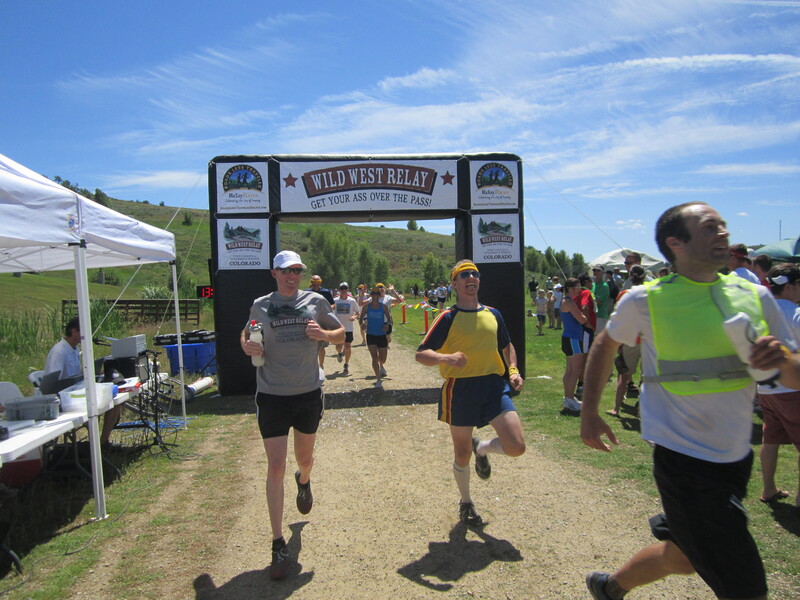 The WWR is a 200 mile distance relay race from Fort Collins to Steamboat Springs that I was recruited for in February. Actually the day I committed to running the WWR was also the first time that I had ever met my friend Laci at CrossFit. If you ever want someone to run in a race I am apparently the person to ask because I will immediately say yes without giving it a second thought! Plus it was February when I said yes to WWR and August was the last thing on my mind. I really had no idea what the race entailed, but thanks to the very detailed emails from the race director, I soon learned more about the race than I ever wanted to know. The WWR is divided into 36 legs, so 12 person teams compete and each person runs three different legs. 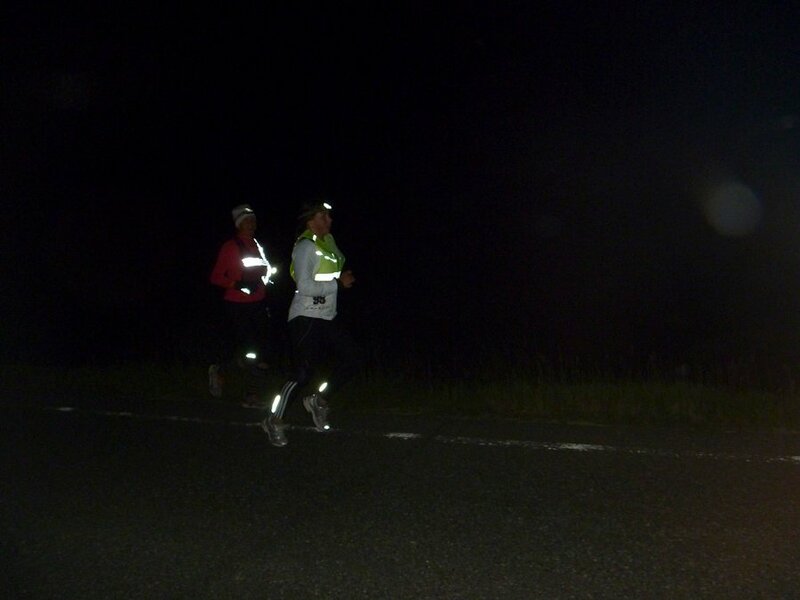 There were actually some even crazier teams that ran the 200 miles with six people as an ultra relay. My three legs seemed very doable in comparison to the amounts of running that these teams did! 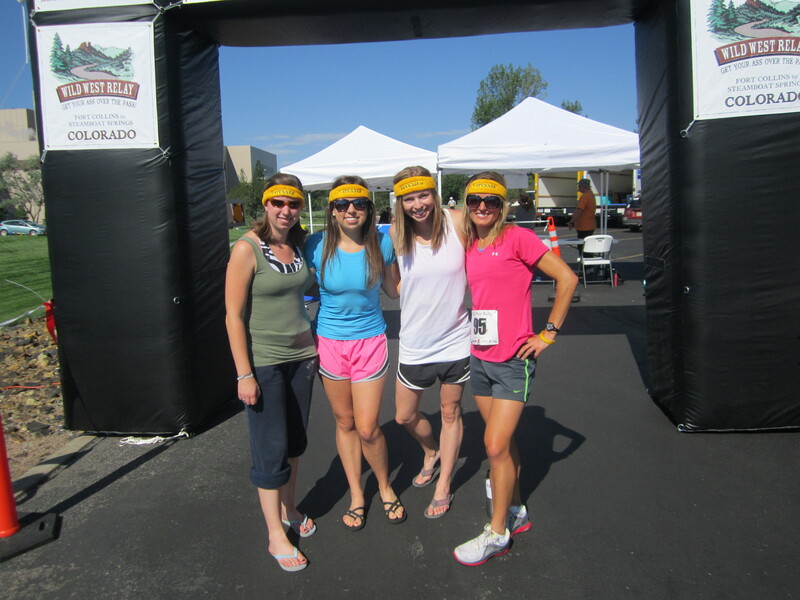 Our team, #1 Stunners, met in a park and ride parking lot bright and early on Friday morning. It was kind of funny, because while everyone knew at least one person on the team, nobody knew every single person. We rode to Fort Collins, where the race started in the parking lot of the Anheuser Busch brewery. Very fitting. We had one of the later starting times at 10:00 a.m. since we ended up with a pretty stacked team that included some ultra-runners. I won’t bore you with the extreme coordination and logistics, but basically only one person on the team runs at a time. The rest of us were divided into an active and inactive vehicle, and legs 1-6 were in one vehicle and 7-12 were in another. I was leg 9, so I was in the second vehicle. Essentially you spent the entire 24 hours or so of the race sleeping, running, or driving with the other five people in your vehicle. This could have gone very badly if we hadn’t gotten along well. But I think to even say yes to a race like this you inherently have to be a fairly adventurous, laid-back person. Needless to say, my van was awesome and we all got along great. 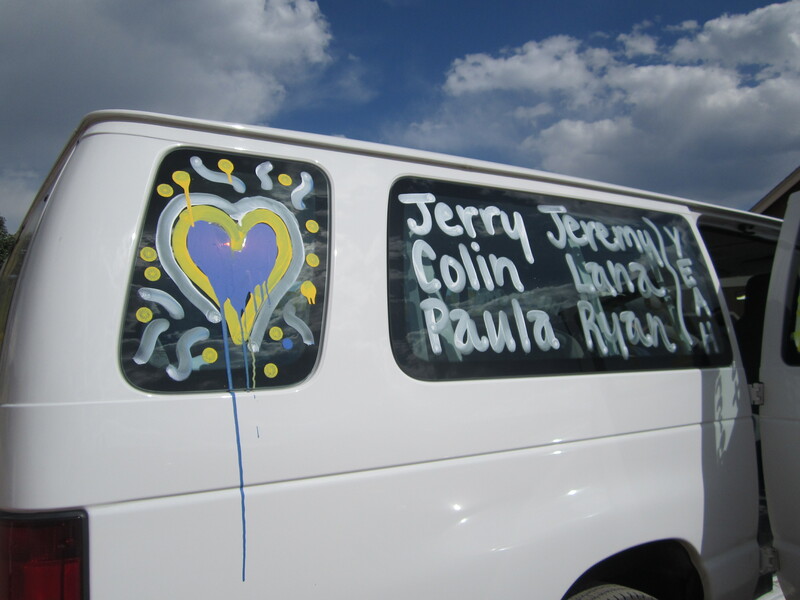 The members of van 2, minus Jerry. Van 2: Jerry, Colin, me, Jeremy, Lana and Ryan. My van’s first legs took place on Friday afternoon, on the side of a hilly, fairly busy highway. My first leg was only 3.6 miles, but it was the least fun time I have had running 3.6 miles in a long time. It was basically straight up the entire way. I didn’t feel great on this leg at all, and this was definitely where I felt like the fact that the race was a relay helped. It can be easy to give up on yourself; it’s hard to give up when you have 11 other people counting on you. Jeremy helping me finish the last few hundred feet of my first leg. 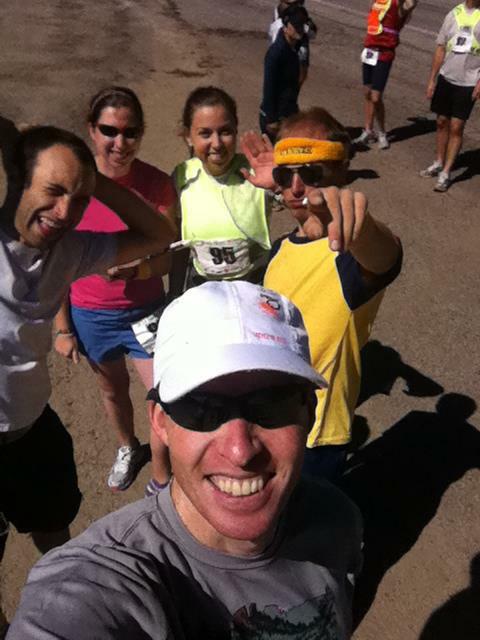 After we all finished our first legs and switched vehicles, we had some time to kill before we had to run again. We stopped at a random restaurant in the middle of nowhere northern Colorado, ate some really bad veggie burgers, then headed to Wyoming, the site of our next exchange. Once we got to Wyoming, we had a few more hours before the other van was going to reach us, so we tried to sleep for awhile. We woke up to the other team on the walkie talkie and groggily prepared to start again. I think we started a little bit after midnight. I started my run around 2:00 a.m. My second leg was 7.1 miles, and I had been worried about being sleepy. This leg actually ended up being my favorite. It was cool temperature wise, and my route took me on gentle rolling hills across the Colorado-Wyoming border. It seemed like every time I glanced up at the sky I saw a meteor. The 7.1 miles truly flew by and I was done before I knew it. Roadkill on my second leg. The night legs were my favorite part of the experience, but I was ready for a solid nap after finishing the second leg. Our van headed to the next exchange zone and crashed. I was so tired that I slept in the crevice between the seats on the floor. It was not comfortable at all. I was also so tired that I woke up after an hour and asked everyone in the van who was going after Chris and telling them we needed to get to the exchange zone. Not only was there no Chris on our team, I don’t even know any Chris’ in Colorado. Apparently the sleep deprivation was getting to me! It was a pretty funny moment for our team. We all went back to sleep for another hour after the Chris incident, waking up around 8:30 to get ready for the next leg. At this point we were all operating on about three hours of sleep and this would be our third run within 24 hours. This was the leg I was most concerned about. Our first runner, Jerry, killed his leg, passing eight people on one of the hardest legs of the race. I was nervous because my leg was 5.8 miles including the summit of Rabbit Pass. Maybe it was the Sharkie fruit chews I had immediately before my leg, but somehow I managed to pace myself well up the hills and cruise down the final 2 miles feeling great. Done with all three of my legs for WWR! 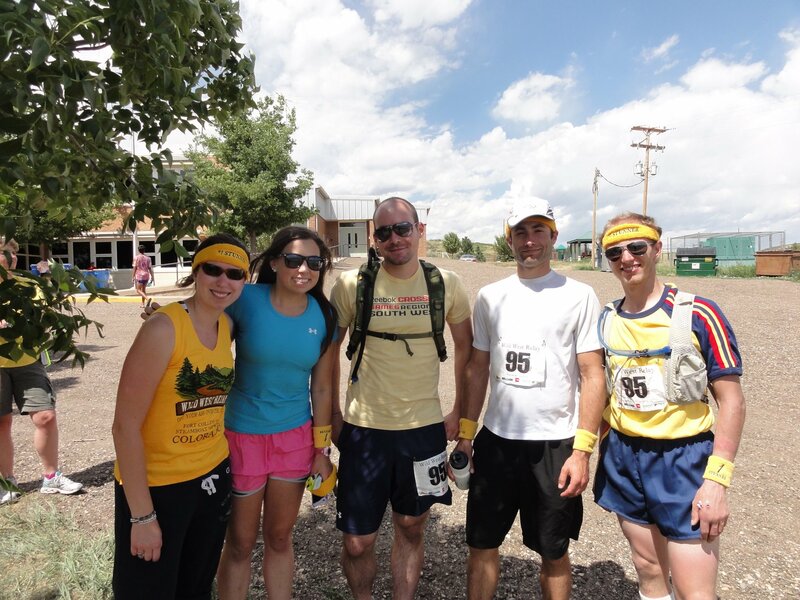 The last two legs, Lana and Ryan, ran through Steamboat Springs in the heat, and we met Ryan at the Steamboat Springs Middle School track for a group finish. Ryan leading the #1 Stunners across the finish. After we finished, our team was ecstatic to learn that we had placed third in our category. We hadn’t even had a complete team until weeks before the actual race, so we were all really excited that everything had gone so well. And we only missed second place by a mere seven minutes! Next year. #1 Stunners with the bronze. I enjoyed the relay format of WWR a lot. 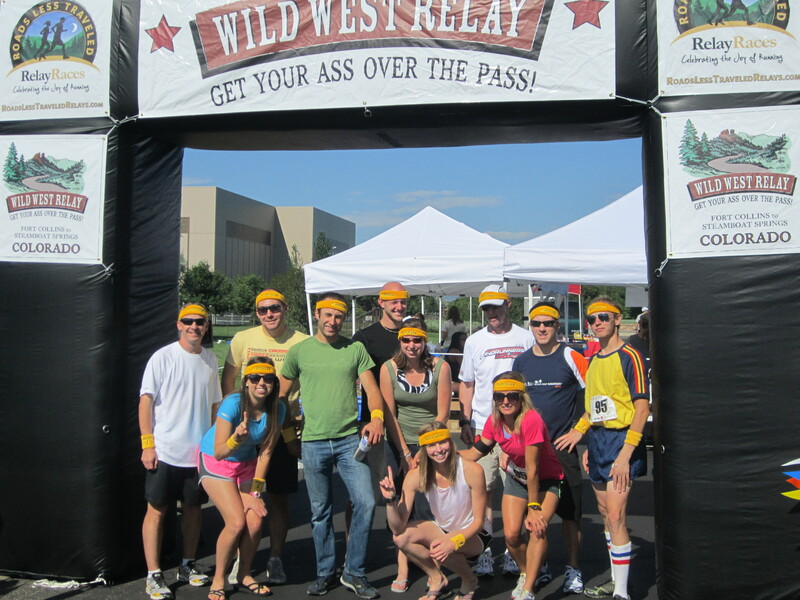 Being a part of a team made it more fun for me than just running a typical road race. It’s for sure one of those things you have to experience to understand. And it really couldn’t have come at a better time for me. Lately, running has not been a joy for me – it has been a chore. 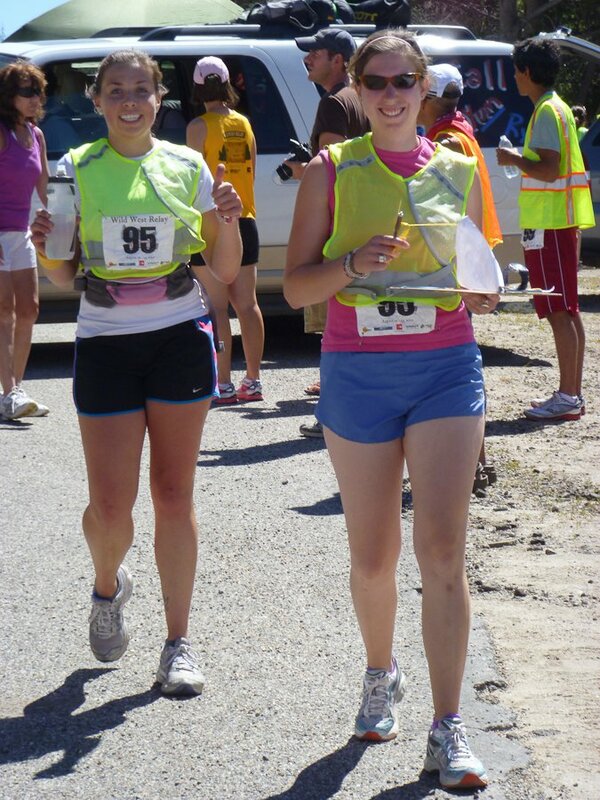 The WWR reminded me how rewarding running is and really rekindled my enjoyment of the sport. Plus I had a great time getting to know the other 11 members of my team. I wouldn’t have spent my weekend any other way. And I got a really sweet sweatband out of the deal. Hanging out before my final leg. 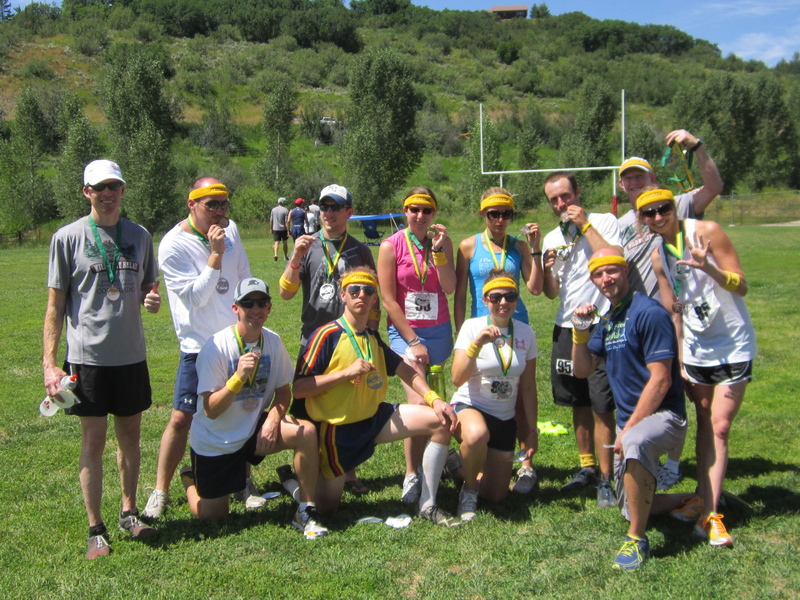 Everyone at the finish line in Steamboat Springs. We made it! 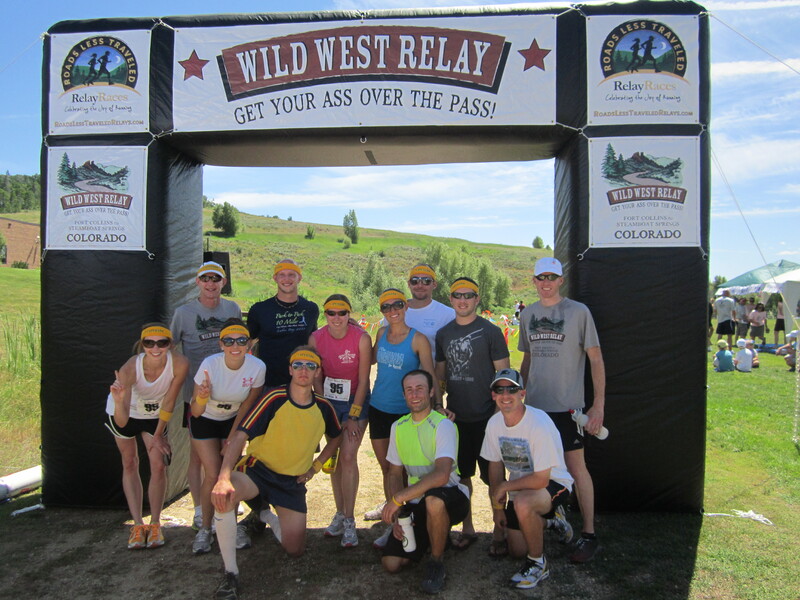 Categories: adventures, colorado, races, running | Tags: colorado, relay race, the wild west relay, wwr 2011, wyoming | Permalink. Great post! Thanks for running with me… see you soon. I know sleepy P Did speak!